What structure does melanin travel along in the melonocyte of a nevi? That was the ridiculous question on a friends test that inspired this cake. The answer is a microtubule. The cake is suppose to look like a mictrotubule. Cake pops were easier to do than icing a cake this way I figured. They took a few days to make but they were really easy to put together. I started off making two chocolate cakes using this amazing recipe. I use this chocolate cake recipe all the time. It makes one level so I double the recipe to make two. Apparently this is called a "depression cake" because it did not require expensive ingredients like eggs and milk so it was used during the depression. It also happens to be vegan so its perfect. If has no weird ingredients. Step 1: Make the cakes as per the linked recipe. Step 2: Break the cakes up in a large bowl. Don't use a potato masher as pictured, hands work the best. Step 3: Add 2 large dollops of vegan icing. I used about 1/2 a cup in total. Mix the icing in well with your hands until the cake dough holds together. Add a bit more if needed but keep in mind that too much icing will cause the pops to be too loose and fall apart. Step 4: Use a meat baller to form cake dough into balls. A meat baller keeps them all the same size. Step 5: Freeze the balls overnight. Ensure they are not touching each other. I separated the layers with aluminum foil so I could stack them and fit them all in the freezer. Step 6: Break up 1 to 1.5 vegan dark chocolate bars in a mug and microwave for 30 seconds. Mix and microwave for 20-30 seconds again, Continue to mix and microwave until the chocolate is smooth. 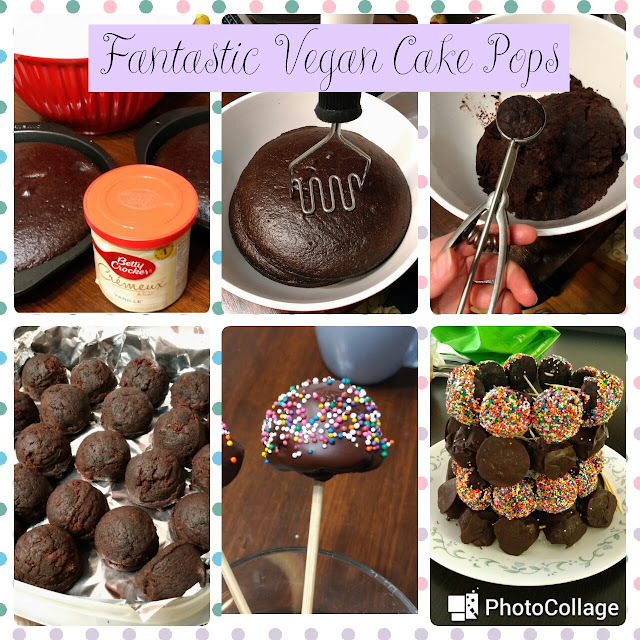 Step 7: Put a lollipop stick or tooth pick in each cake ball. Dip the cake pop in the chocolate and allow the chocolate to drip off. You may need to remelt or melt more chocolate from time to time until the balls are all coated. 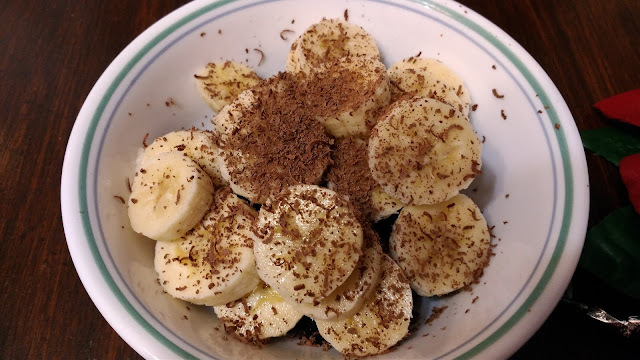 I brushed chocolate onto some and dipped them in sprinkles to save chocolate. I placed the pops directly on the foil but you could keep them inverted so the chocolate stays perfect looking by placing the sticks in a short glass. I don't know where I got this recipe from as I have had it a very long time. It's evolved a bit from the original so I am going to post it here. This is a big recipe, it fed 15 people and there were left overs so be warned. Put everything in a really big pot. Start with 2 tbps of chili powder, you can add more later if it is not spicy enough. Make sure the bullion cube dissolves, it is sometimes easier to add this after the whole mix is boiling. Bring to boil on high heat then simmer until everything is cooked. This can take an hour or two. 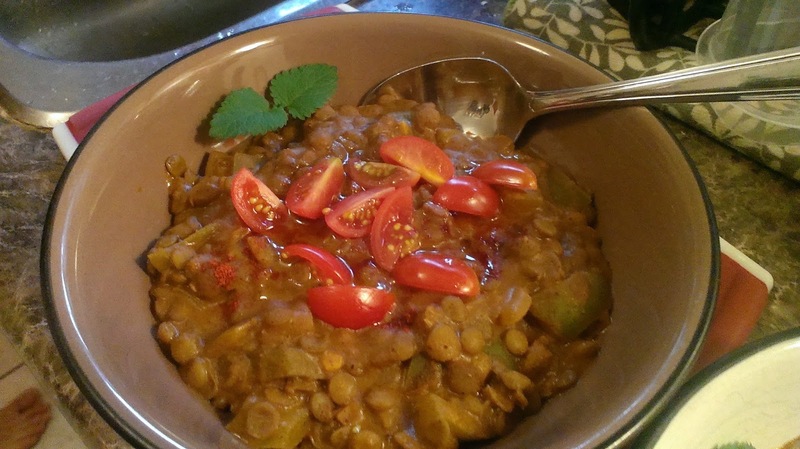 The lentils should be tender and the onions translucent. Add more chili powder at the end if necessary. You can make this the day before and let the flavors mingle in the fridge overnight. Then you simply warm it up the next day and it is extra good. Serve with bread or nachos or both. 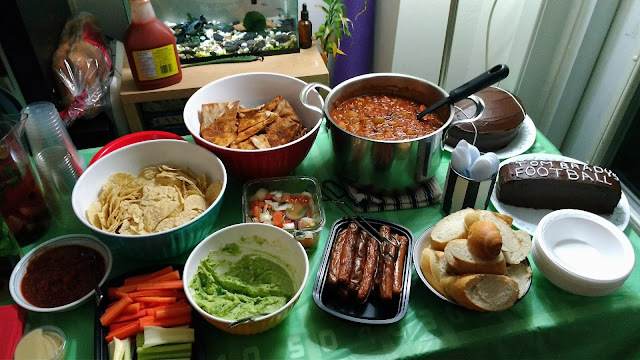 Pictured to the left of the chili.These are from the Oh She Glows Cookbook on page 91. I could not find the recipe on her website but I did find it here. I multiplied the recipe by 3 to make enough pita chips for the party. I modified the recipe slightly. 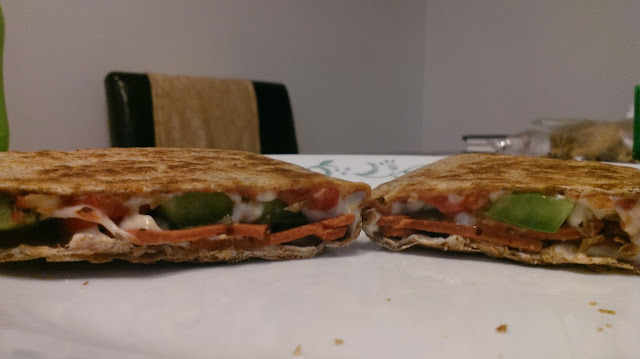 I mixed the spices with the oil, brushed the mix on to the top and bottom of each pita then stacked them up and cut the whole lot into wedges. 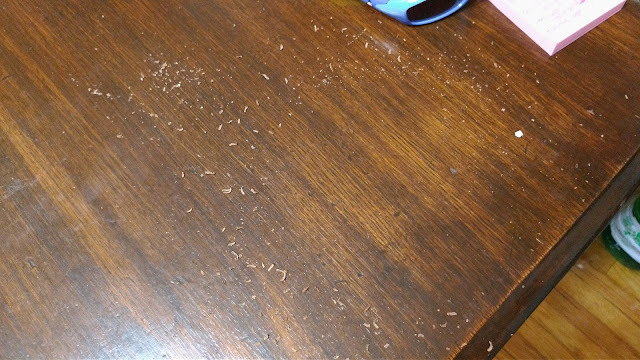 That is a lot easier than brushing each piece individually. Remove the avocado flesh from the skin and pit. Place it in a bowl. Squeeze juice from a lime into the bowl catching the seeds or just add 2 tbsp of lime juice. Mash avocado and lime juice together with a potato masher. Add salt and pepper to taste, Mix in cilantro. Pico de Gallo is amazing. It is pictured above between the guac and the pita chips. It is best to make it the night before to let the flavours mingle over night. Leaving the onion in the acidic lime juice will dull it's sharpness. 1 jalapeno, diced really small. If you don't like it hot, remove the seeds. 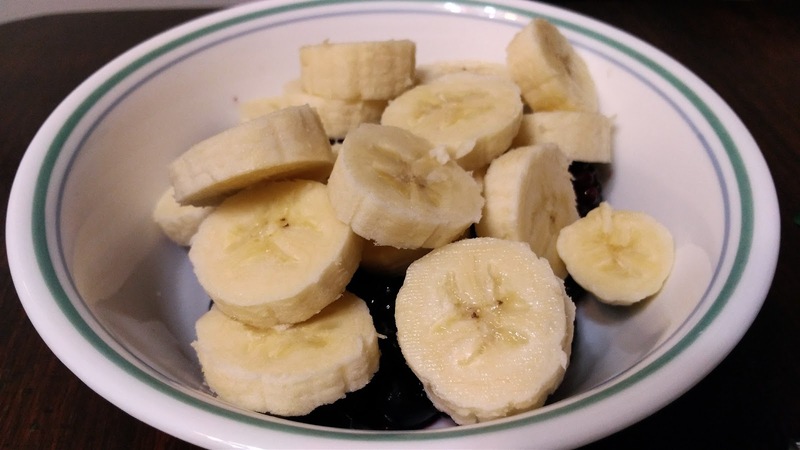 Mix everything in a bowl or container. Leave in the fridge covered overnight. Serve cold the next day. I have been using this cake recipe forever. It is fantastic, economical and can be found here. 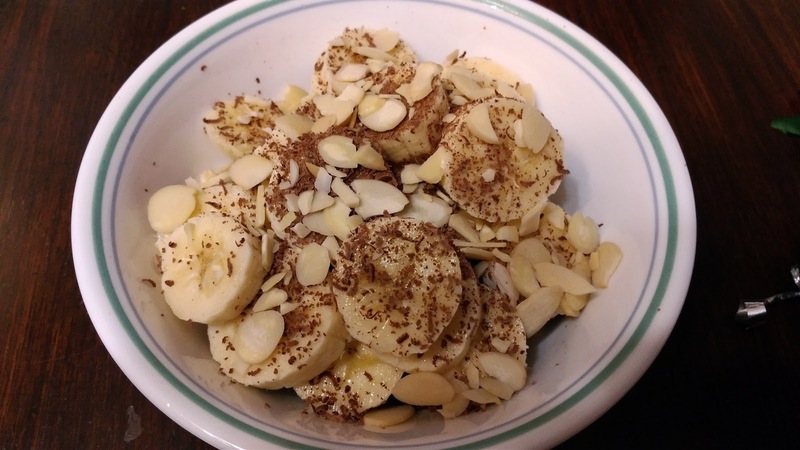 A friend of mine figured out that the recipe is one used during the depression when eggs and dairy were hard to come by. The recipe makes only one layer so I double it up to make two. I bought the icing from the grocery store because there was too much to do to make it from scratch. 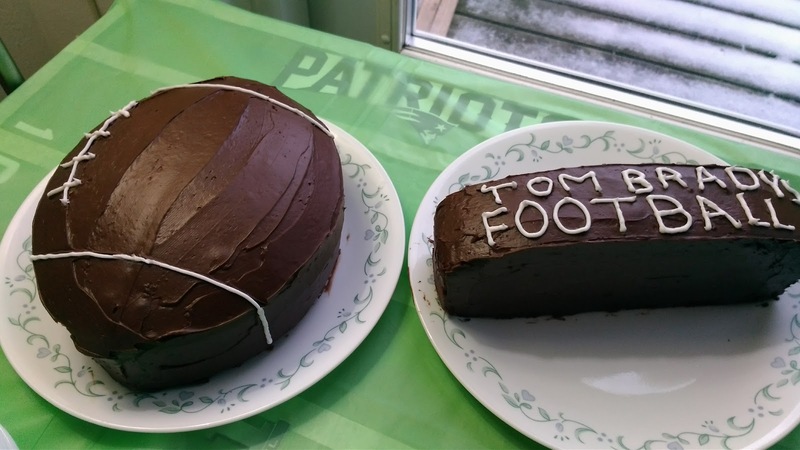 To make a football shaped cake, you just have to cut a sliver out of the middle and push the two sides together. I iced the sliver to make a second cake. 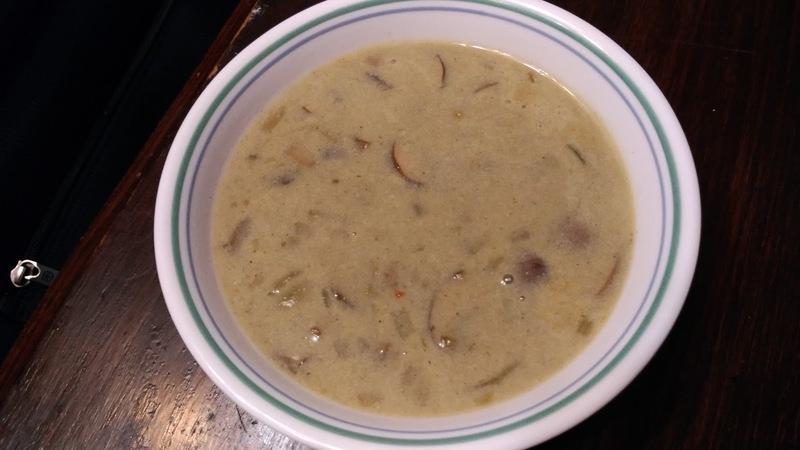 This is a great soup for the winter and it has been extra wintery this week with the ice storm and then the snow this week. Both husband and child approved. I don't think it is filling enough to count as an entire meal on it's own but pairs well with a fresh bred or grainy toast. Makes a little more than 2 servings. 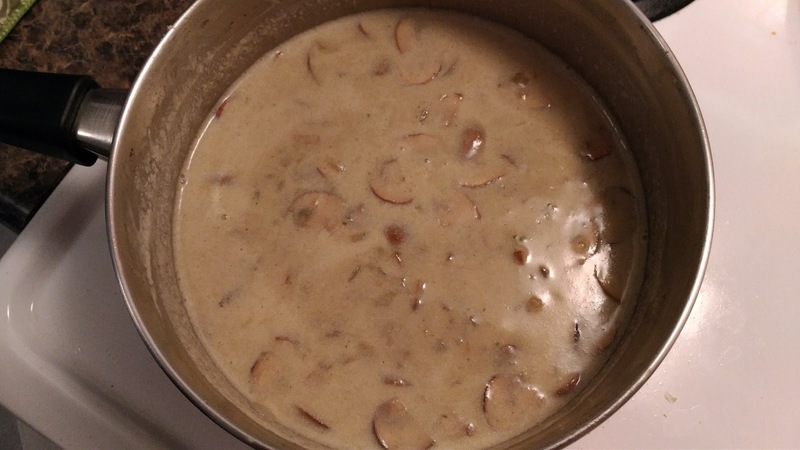 Add olive oil, mushrooms and onion to a regular sized pot on medium heat. Fry while stirring until the mushrooms look cooked and the onion translucent, taking care not to burn the onion. Add bay leaf and thyme. Add bullion cube, and squish it up with the back of the spoon to help it dissolve when the water is added. Add the flour and stir the whole thing well. I needed something easy and healthy that would fill our tummies. This one is a bit soy heavy, there are soy nuggets and tofu involved, but why not load up on protein once in a while. There are lots of veggies to balance it out. My husband really liked the hoisin smothered soy nuggets. 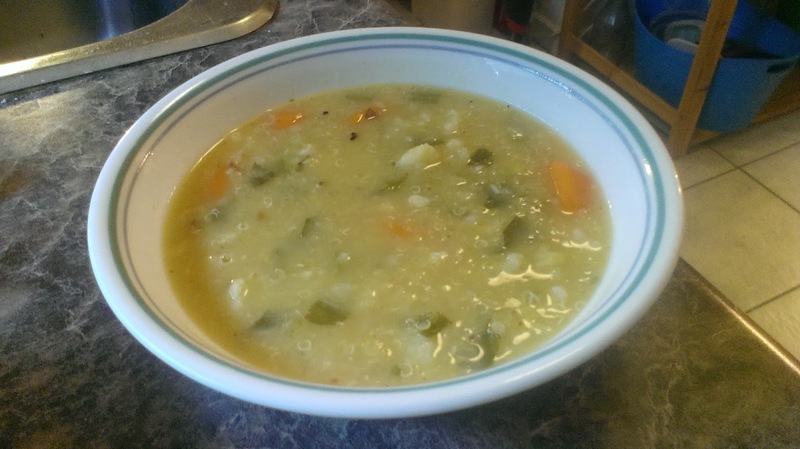 It's a great recipe to use up left over rice which we always seem to have kicking around. 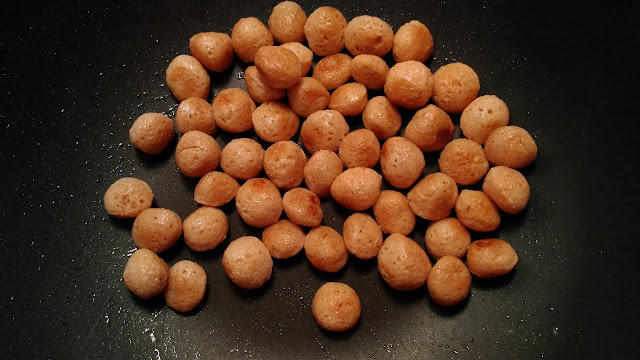 Soy chunks are cheap and full of protein so I have been looking for a chance to experiment with them. I am averse to dishes so I just used the one wok but you can fry the rice and the soy chunks in separate pans if you like. About 1 cup of Dried Defatted Soy Chunks, soaked for 15 minutes and squeezed out. Add some oil to the wok and set it on medium heat. Fry the soy chunks until golden then transfer to a bowl and set aside. 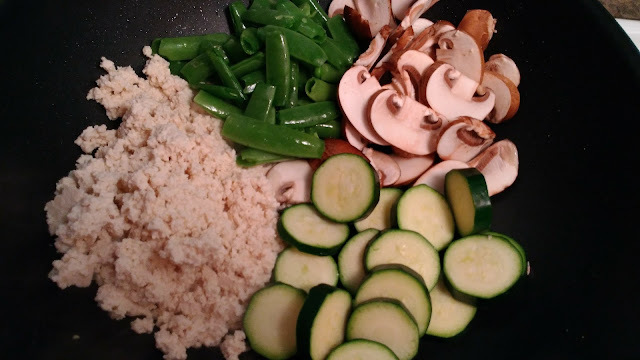 Add a bit more oil to the wok then add the peas, mushroom, tofu and zucchini. Fry on medium to high heat until the tofu begins to dry out and the veggies cook a bit. Then add the rice and soy sauce and continue to cook until the vegetables are cooked to your liking and everything is well mixed together. Transfer fried rice to plates. Add soy chunks back to frying pan to warm up, add hoisin sauce to taste and stir well. Serve on the side of the rice and enjoy. I got a rather expensive salad at a restaurant. The description was amazing but it turned out to be mostly leaves and I was starving so I throw together dessert when I got home. This turned out to be really good and also really healthy. It's mostly fruit and fruit is great. 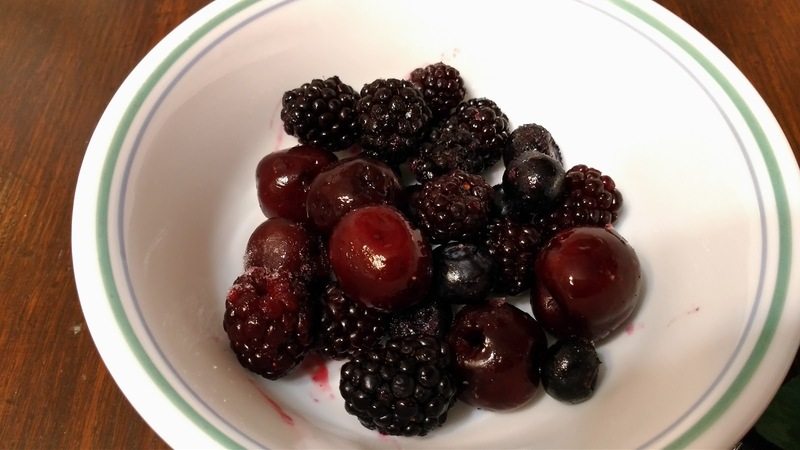 Lots of vitamins and antioxidants in them. Chocolate and coconut whipped cream are good for my happiness so that's always helpful. 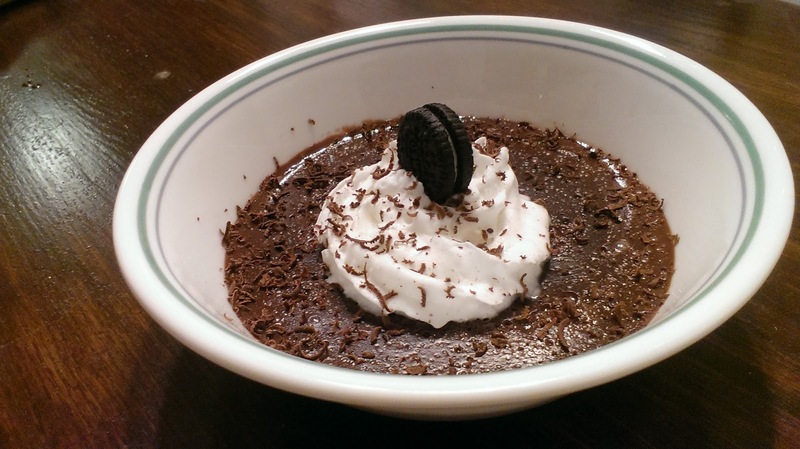 This turned out pretty decadent and it was the result of just adding everything I could think of that I had on hand. 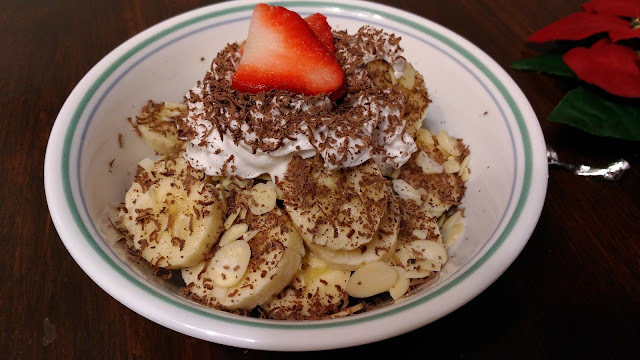 I got chocolate shavings everywhere but it was worth it. 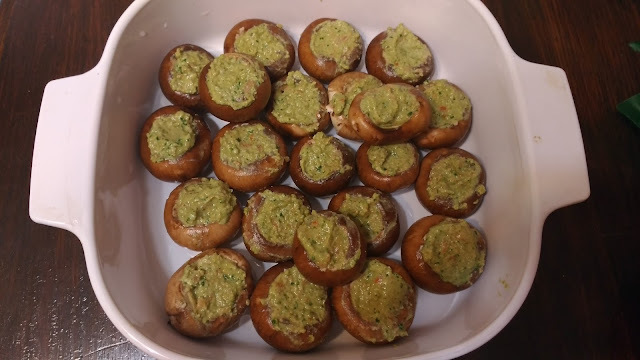 Cremini Mushroom Caps Stuffed with Garlic Cilantro Pesto. This recipe packs a flavor punch. It's pretty easy to put together and since my son loves mushrooms he actually eats this too. 1. Turn on oven to 450 degrees. Place the sunflower seed in a food processor and run until the seeds become a powdery meal. 2. Add garlic cloves and run food processor until the garlic is combined and the mix looks like a more course meal. 3. Turn off machine, add cilantro, lemon juice, soy sauce and tomato. Process until the ingredients are well mixed. 4. Wash mushrooms and remove the stems. 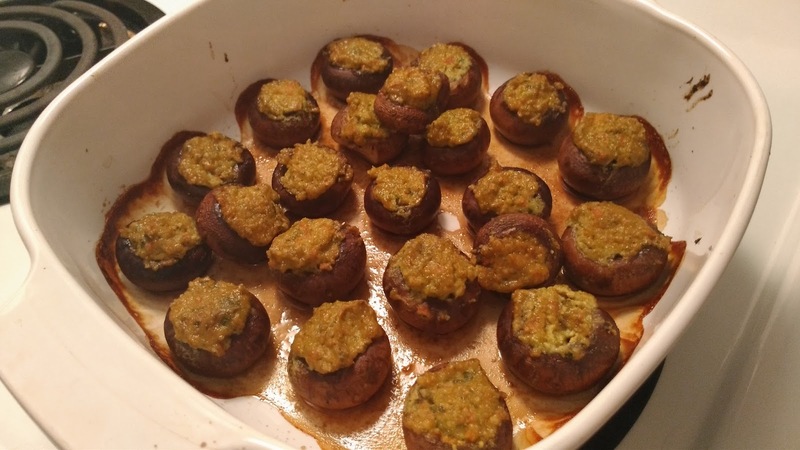 Fill each mushroom with the pesto and place in an oven safe baking dish. Cook in the oven for 20 minutes watching closely for the last 5 minutes. 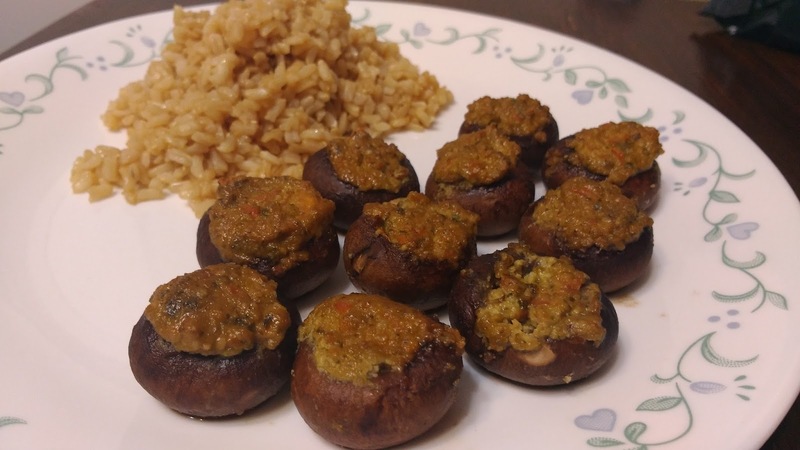 I sample one of the larger mushrooms to make sure that the pesto is fully cooked (my son gets upset if the garlic is too spicy). 5. That's it. Enjoy. If there is left over pesto, you can use it in wraps or sandwiches. The Dilemma: We received a big, beautiful butternut squash in the organics vegetable box we ordered this week. My husband does not like squash but we have one so it must be eaten as organic food is pricey. The Solution: Blend it and add it to a spicy soup. My husband had seconds and my son ate it all so it must have been good. 1. Cut the butternut squash into large pieces, (removing the seeds and goop) arrange on a large plate and microwave on high until cooked. This took my microwave about 10 minutes. When cool enough to handle, remove the skin and blend the squash with a bit of water until smooth. 2. In a large pot on medium heat, add olive oil, pepper and celery and cook for 2 minutes. 3. Add garlic and cook for 1 more minute. 4. Add squash, coconut milk, water, ground ginger, turmeric, sun flower seeds, quinoa. 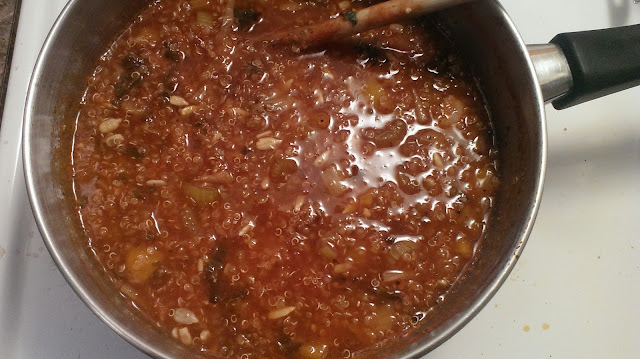 Bring to boil at higher heat then bring to low heat and simmer until the quinoa is cooked (no longer has white center). 5. This is where I remove my son's portion as he does not like spice. 6. Mix in 2 tsp red curry paste, salt and black pepper to taste. Top with fresh tomato and green onions. Every once in a while I need to eat some awesome dessert. This recipe is incredibly easy and does not need a lot of ingredients. As a basic recipe, you can customize it a lot. Cocoa is good for you and the soy milk has protein and B12 if justification is needed. Needless to say, my son likes this recipe a lot. Mix first three ingredients together in a pot. Add about a half a cup of the soymilk and mix well, Add the rest of the milk stirring well to combine. Heat on 4 (medium-low) continuing to mix with a whisk until the pudding thickens. Pour into bowls and put them in the fridge to cool for about an hour. Once cool, top with the chipped cream, chocolate shavings and Oreos. It was early in the week and we had not had time to do a proper grocery. Fortunately there are vegetables in the house (there almost always is) and a few growing outside. We always have garlic and vegetable bouillon cubes and that is all you need for a soup base. Here is what we created from what we could find. Not the prettiest dish but it tasted good and was filling. celery, 4 stalks if home grown, 1-2 stalks if from the store (we also chopped up the leaves and added them. Add the 4 cloves of garlic to a large sauce pan with the olive oil. Saute on medium until the garlic is fragrant and beginning to brown slightly. Don't let the garlic brown too much or it will taste burnt. Once the garlic is cooked, add about 1/2 a cup of water to stop the garlic from frying further. Stir in the bullion cube so that there are no large clumps. Add about 5 cups of waer and set to high heat. I post a lot of recipes in this blog which would lead one to believe that I do all the cooking in the house. Fortunately for my sanity, this is not the case. My husband has his own set of recipes and makes dinner rather regularly. This is one of his concoctions and it is quite good. 1. Soak 6-8 skewers in water while you are chopping up the veggies and tofu. 2. Put zucchini in a bowel and sprinkle on some lemon pepper seasoning. Mix until evenly dispersed. 3. Impale the veggies with the skewers by piercing them with the sharpened end. 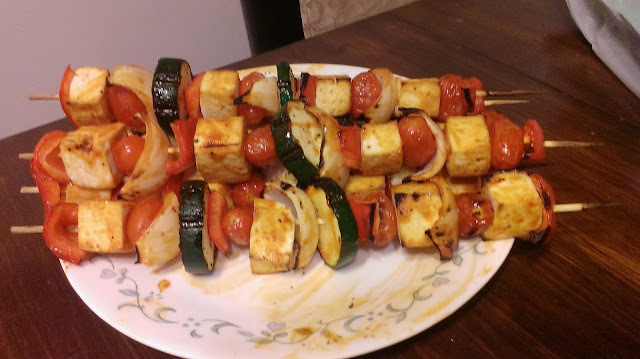 Split up the veggies more or less evenly among each skewer. You can choose to arrange the veggies in a pattern or not, what ever works for you. 4. 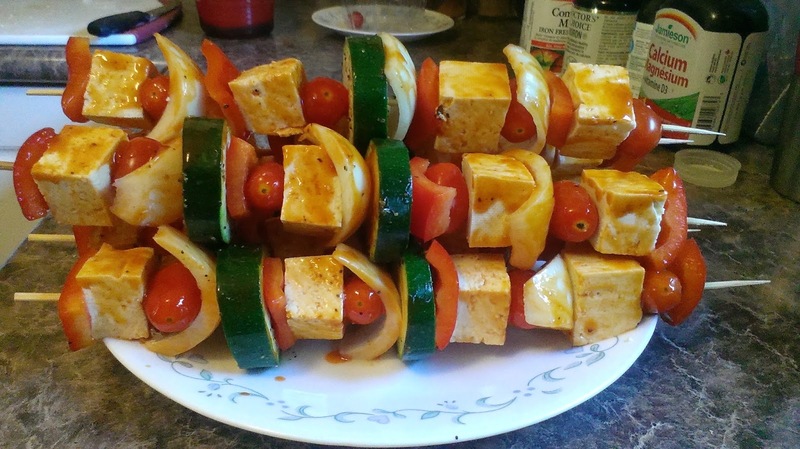 Using a kitchen brush, spread the BBQ sauce over all the veggies and tofu except for the zucchini. 5. Use an aerosol oil to coat a clean grill of the BBQ. Turn the BBQ on to low-medium heat. Place skewers on the grill after it has heated up a few minutes. 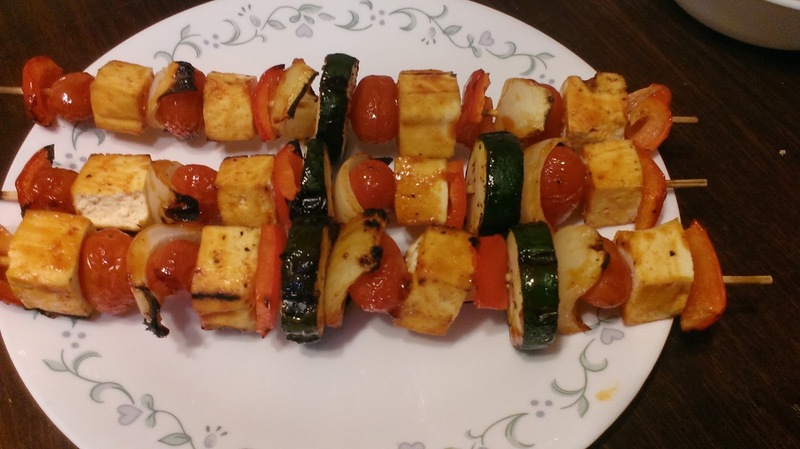 Flip the skewers every 3-5 minutes until cooked to your liking. Use BBQ tongs for the flipping. Add more BBQ sauce to exposed side periodically. This recipe has evolved over time from something completely different. It was originally a butter-less, chicken-less, butter chicken recipe but soy chicken is crazy expensive and lentils are just amazing. They are packed full of fiber, protein and iron and my son will actually eat them so they are perfect. 1. Cook lentils according to package directions. 2. In a frying pan or wok over medium heat, fry onion for about a minute then add garlic and fry both for another minute. Add green pepper and fry until onions turn translucent. 3. Stir in the can of tomato soup, then stir in the soy milk. 4. Add all the spices and mix well. Strain the lentils once they are cooked and mix those in too. 5. Top with tomatoes, a drizzle of olive oil and a sprinkle of paprika. 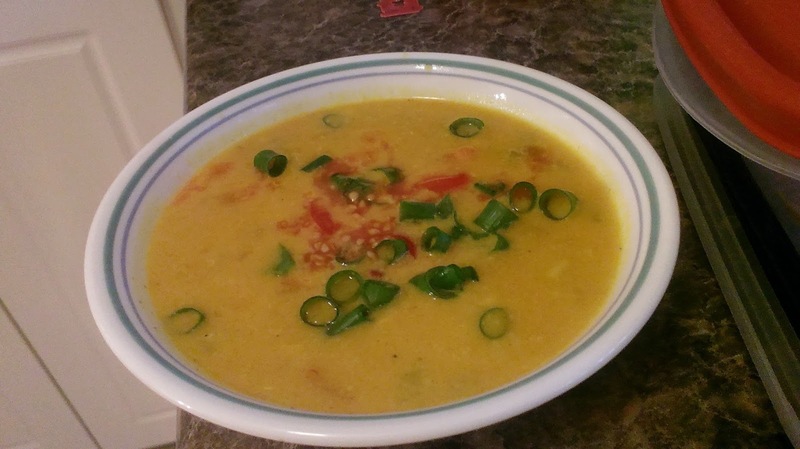 Serve with naan or rice. 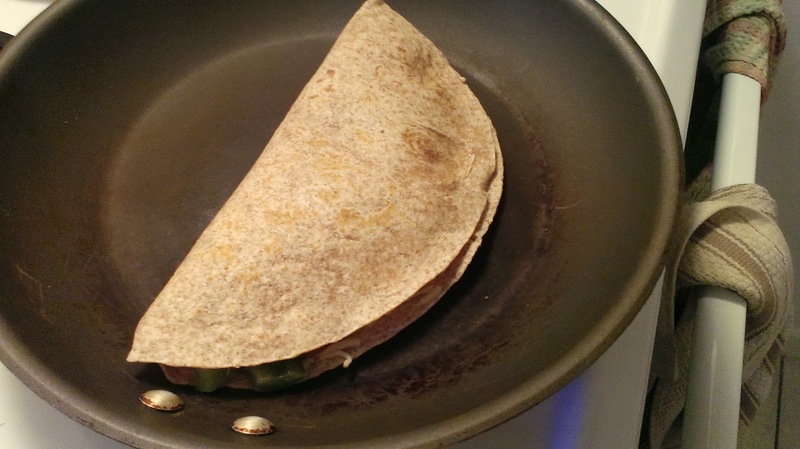 We did not start off intending to make quesadillas again so soon. The plan for tonight was pizza. We had dough left over from another meal that we intended to use but when I went to roll it out is smelled like booze. I guess we let the yeast act on it a little too long. On to plan B. 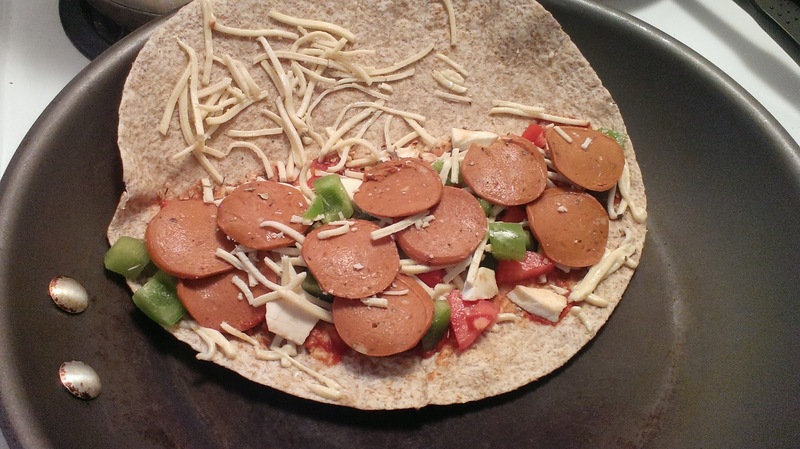 There were wraps so opted for pizza a slightly different way. 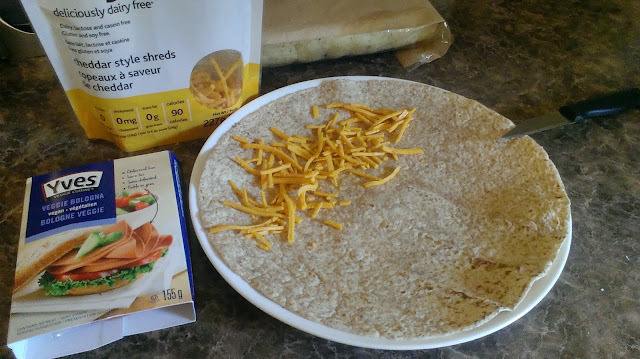 I was not confident the wrap would provide enough support for the toppings as a single layer and quesadillas are faster to cook so that became the new plan. It worked well, my 4 year old liked them though we used a different vegetarian luncheon "meat" due to his hatred for anything spicy. Lay out the wraps. Spread a thin layer of pizza sauce over half of each one. Add a layer of daiya over the pizza sauce followed by the pepperoni, pepper, tomato and more daiya. Fold the clear half of the wrap over. 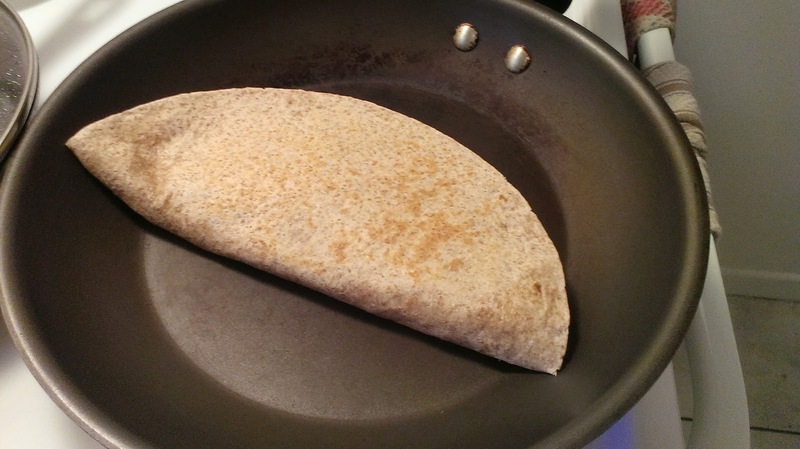 Fry without oil on a clean frying pan on medium heat until the cheese melts and that side browns. Flip and fry the other side. Chop in half and enjoy. 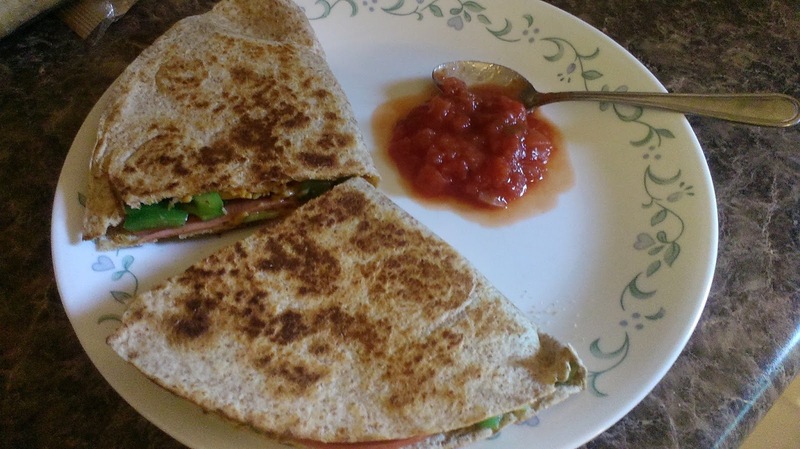 We had to eat, we had soccer coming up fast, we couldn't waste anytime so we throw together some quesadillas. I was introduced to quesadillas in undergrad. They are customizable so I could order the ingredients I wanted, watch them make it, and be certain there was nothing lurking within that I was allergic to. This was an amazing discovery for me because posting ingredients to prepared cafeteria food was not common back then and I would frequently have allergic reactions to foods that seemed allergen free. We left university a long time ago now but have continued making quesadillas at home. This is a simple base recipe that can be added too. You could consider adding chopped snap peas, sweet onions, banana peppers, tomatoes, etc. The highly processed bologna could be replaced with seasoned tofu, beans or quinoa. 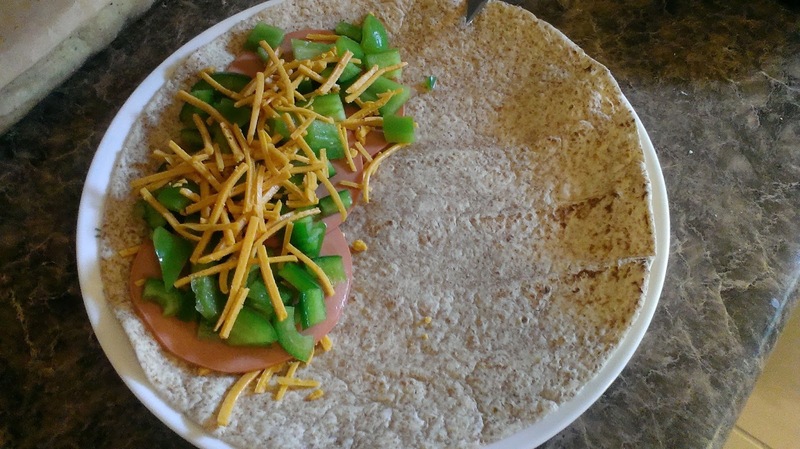 Lay wrap flat on a plate and sprinkle daiya over one side. Lay the bologna over the cheese. Add pepper and any other toppings you like them top this layer with more daiya cheese. Fold the wrap in half over the toppings. Bring a clean, dry frying pan to low-medium heat. Add the quesadilla, cooking until the side browns slightly and cheese on that side melts then flip to cook the other side. Transfer to plate, cut in half and serve with salsa for dipping. 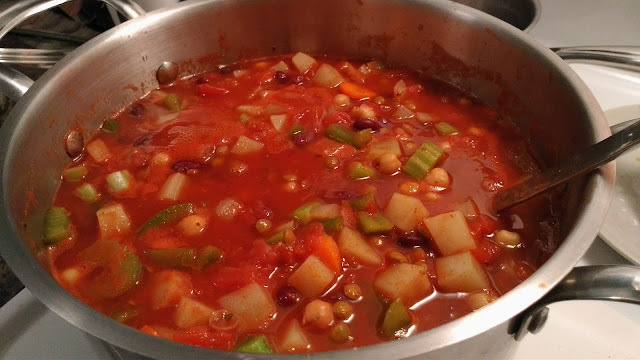 If you have tomatoes, an onion, some sun dried tomatoes and other vegetables (almost any others really), you can make soup! Here is one such soup. 3 pieces of sun dried tomato . Put the sun dried tomatoes in a high speed blender with a bit of water and blend for about a minute. Leave them to soak for 5-10 minutes to soften the tomatoes then blend again until there are no large pieces. Add the fresh tomatoes and onion to the blender. Blend until smooth and pour into a large pot. Bring the tomato mixture to a boil on medium high then lower to medium. The soup base should turn from pink to red. Add the rest of the ingredients, boil until the vegetables are cooked. Add more water if needed to maintain a desirable soupiness. I love dandelion greens but this has not always been the case. They are bitter, there is no way around that. We are not use to eating bitters anymore because the taste has been more or less breed out of the other vegetables we eat over a long long time. It's too bad because they are good for the digestive system. The first time I bought them I boiled them and was not able to eat them at all. This was 11 years ago and now I buy them when ever they look healthy in the grocery store. I had to learn to love bitters slowly. I was motivated after learning about how amazing bitters are for your health from an expert in herbal medicine. I started consuming moderately bitter greens like escarole. I would eat it until I stopped noticing the bitter tastes as much and started to notice the sweet notes then I'd move on to another more bitter green after a few weeks. 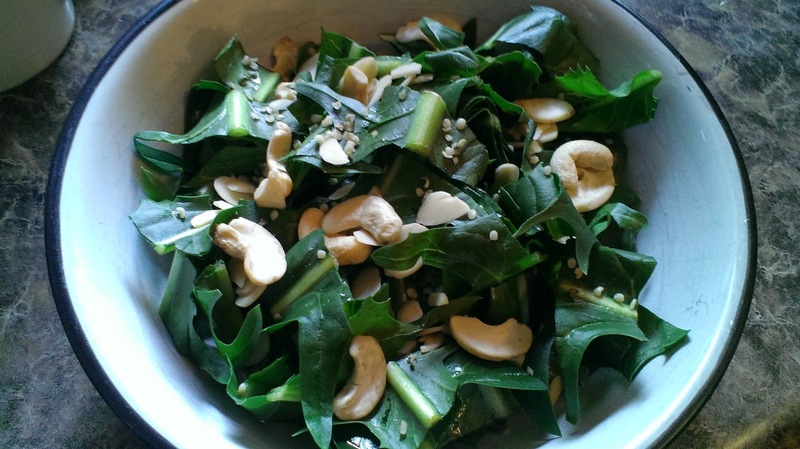 The dandelion greens looked good today so I nabbed some for a simple, antioxidant rich salad. To my surprise my husband requested some and actually ate the whole bowl full. He did not claim it was enjoyable. favorite dressing. Lemon with olive oil and herbs works well with the bitters. I don't eat a lot of salad. It was the first thing I got sick of when I went vegan, but I have been craving salads more often lately so I am bringing them back into the rotation. There is nothing too fancy about this particular salad, just veggies, seeds and a dressing I put together last week with ingredients we had on hand. Thus the accompanying tofu had to be a little special. 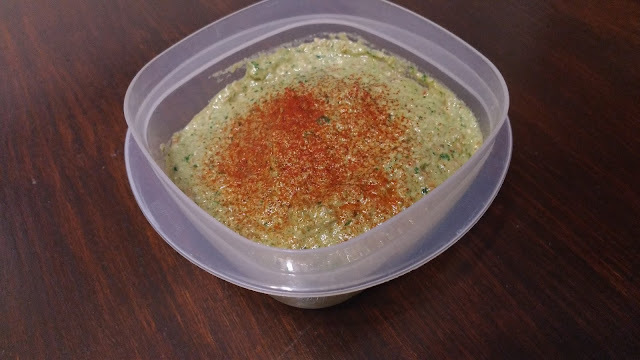 I didn't include the dressing recipe here because I didn't measure anything exactly and it was a week ago so my memory is foggy. I will have a future post on how to throw together salad dressings. 1. 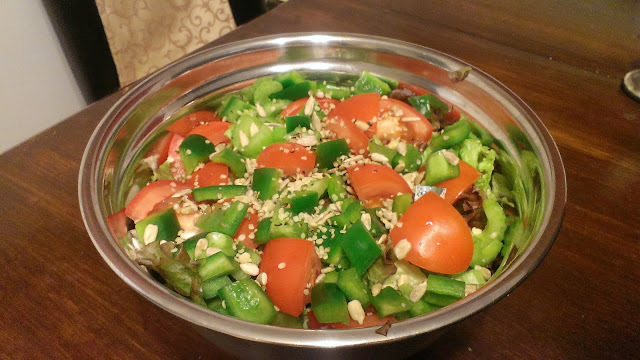 Chop salad veggies and combine in a bowl. Quantity is not important with salad veggies, chop as much as you like. 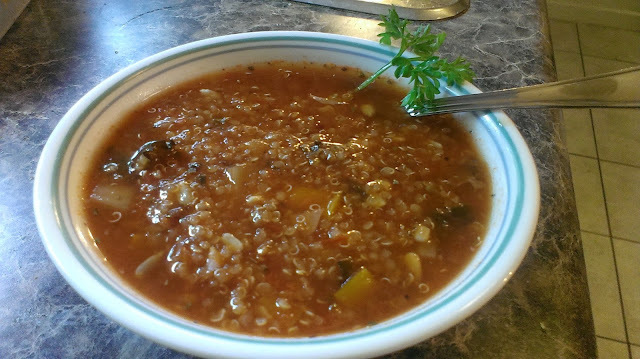 Sprinkle sunflower and hemp seeds over top and set aside. 2. Add olive oil to a pan and heat on medium. 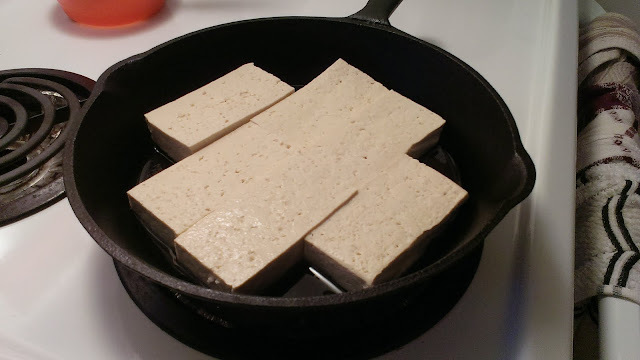 Before the pan gets too hot, arrange the tofu slices on the pan so there is no space between then (pictured above). 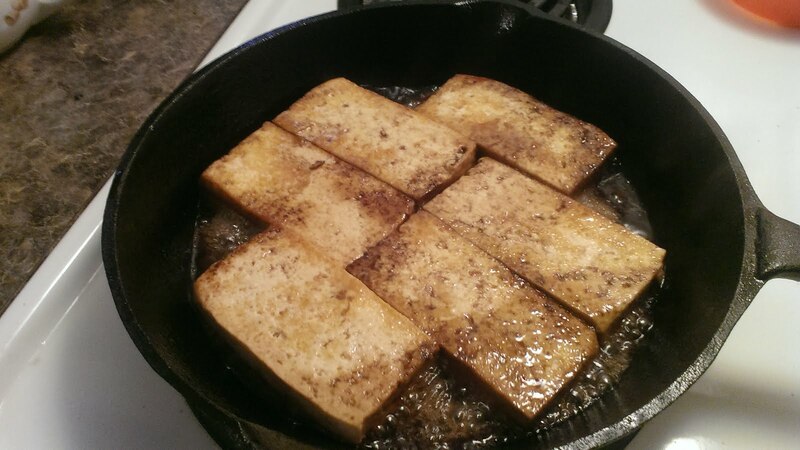 3, When the oil starts to bubble pour the maple syrup and balsamic vinegar over the tofu. Keep a lid to the pan handy during the pour in case there is splatter when the syrup and vinegar mix with the hot oil. 4. Cover the pan and left the tofu cook until the bottom begins to brown. Then flip to brown the other side. The maple syrup should caramelize a little. When both sides have browned a bit, add salt and pepper to taste. 5. 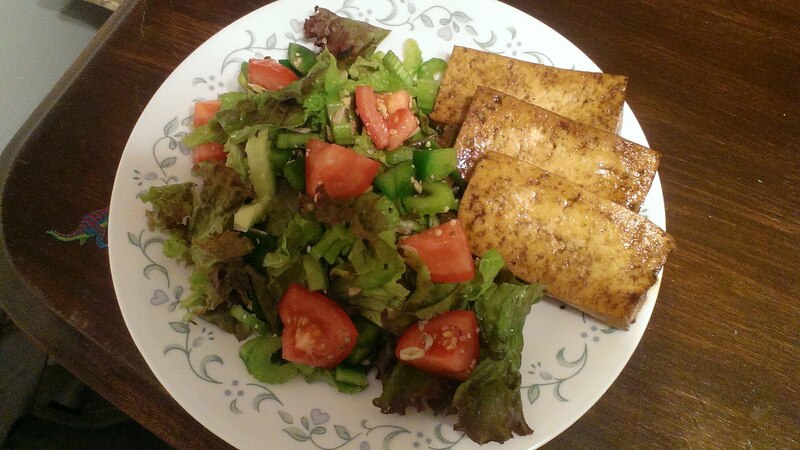 Add salad and tofu to a plate. Add favorite dressing to the salad and enjoy. I have neglected to post in the last few days. My parents were visiting on the weekend then one of my cats became very sick. We have been back and forth between home and the vets since Sunday. The prognosis unfortunately keeps changing which has certainly taken its toll but now the outlook is bad for my poor little kitty. He is on a pile of drugs now in the hopes that one will work by some miracle but at this point it is getting unlikely. To add insult to injury at the worst possible time, the government has decided I don't qualify for a tax benefit that they thought I did and would like me to pay them back $200 "immediately". It's funny how they take forever to pay us out any money but they want theirs "immediately". So vodka is the current solution (which is a pun). Since stress causes my body to be ridicules I was blessed with a UTI out of nowhere. 100% cranberry juice fixes these up in no time but is not particularly enjoyable. Hides the taste of vodka like a champ though. So here is my easy cocktail for when one is stressed out to the point of minor immune failure. 2. Add vodka, don't measure, just pour. Add about 1-3 ounces. 3. Top with some water to take down the tartness of the cranberry juice a bit. 4. Drink and forget your troubles just for a little while. It is not a sweet drink, but sweet drinks don't fit with sour situations. It's really not much to look at. Not sure why I even took a picture. This is an easy, weeknight meal. I also served corn on the cob that night because corn was on sale so we had this a more of a side dish I suppose. I also had it for lunch the next 2 days. If made 4-5 servings as a side dish, probably 2-3 servings as a dinner. 2 cups of dried pasta. Most shapes will work for this, I use noodles made of durum semolina because they are vegan and cheep. 1/4- 1/2 cup of vegan mayonnaise. I would recommend Earth Indian (green lid) or homemade mayo because they are good and most vegan mayonnaise is gross. Very gross. I also hung up some hats along the ceiling because I want the shelf space for other things. Scarfs are hung below on command hooks. I need a few more hooks to make it look a bit more symmetrical. This was a very fast project. 1. Staple some colourful paper to a canvas. 2. Staple a string on the back to hang it up. 3. Nail some nails around the edge of the canvas, more or less evenly. 4. Weave embroidery thread haphazardly around the whole get up and tie it. For mornings when you need some protein and a kick of caffeine. Also good for warm, humid days when the idea of drinking a hot coffee is off putting. Makes about 2.5 cups.